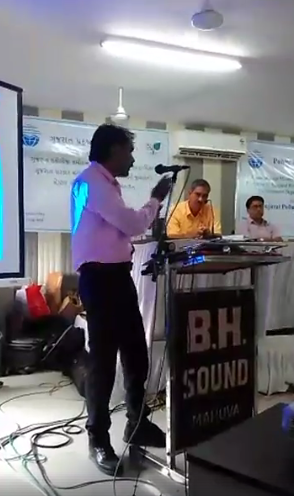 Participants in a public hearing for the Coastal Zone Management Plan (CZMP), held in Rajula, Amreli district of Gujarat, on Wednesday made a strong plea for suspension of the public hearing because, according to them, the maps they were offered through the net were not in accordance with the directions given by the National Green Tribunal (NGT). Pointing towards “incomplete” and “undeveloped” maps of 29 coastal villages, local MLA Amishbhai Der, Congress, said no separate village maps were given to them, hence it was impossible to find identify what type of plan was being sought. Strange, he added, there is no mention of the Shiyalbet island, which is part of the district. Local social worker and lawyer Arvind Khuman, also demanding cancellation of the public hearing, said that the maps should be such that people are able to understand and they should be accompanied with explanations, Also, they should come with sufficient explanation on how CZMP is going to be implemented along the coastal area. However, he regretted, the maps they were offered had several major shortcomings. Thus, the maps do not have any reference to the jetties for fishing boats. Also, the survey number of each village is not shown in the maps, nor is the name of the villages shown. How could people understand these maps?, he asked.